Holly Black has created a gripping tale of mobsters and dark magic where a single touch can bring love -- or death -- and your dreams might be more real than your memories. White Cat was a little bit of a slow starter for me, like so many first-in-a-series books. 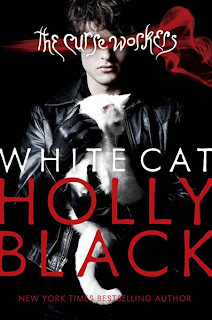 I've always heard good things about Holly Black, and when Natalie came back from the Smart Chicks Kick It signing with White Cat, she had me read it first (to make sure she'd like it). That's how we operate---she finds new books and I'm her gateway to four and five star reads. About halfway through the book, the story got so intense I couldn't put White Cat down. The combination of Cassel running cons, the back-stabbing family members, Cassel's guilt over Lila, and the truth behind Lila's death made for a unique, surprisingly intense story. I also really enjoyed the hoarder aspect. There were a lot of really well-fleshed out details in this book, which made the book feel much smarter than many YA reads. It's rare that I enjoy a first-person narration from a male perspective as much as I enjoyed White Cat. I loved the curse-worker basis of the story. Curse workers are both feared and revered by the rest of the world and everyone in Black's world wears gloves to protect themselves from curse workers who work curses through touch. The addition of the illicit photographs featuring bare-handed women was a nice touch. The ending left me wanting more, and I'm really looking forward to Red Glove, book two in the series. I think I'll read Holly Black's other books in the meantime--her writing style is smart and intriguing and I need more! The slow start. I kept putting the book down waiting for more to happen. All of the intricate details were pulled together to make an excellent plot, pacing, and unique elements. I'm so glad that you liked it, Kelli! It's definitely a slow starter, but once the mystery aspect is more defined the books does get better. I loved how flawed the characters are, including Cassel. The ending with took me by surprise. I loved this book. I don't remember it being a slow starter but don't remember being entranced immediately either. I really liked Cassel. Actually, it is often a relief to read a boy's POV. Hmmm... I've actually never read anything by Holly Black. (Shocking, I know!) Maybe this will be my first from her? Thanks for the review! A 21 is still a pretty good score. LOL! Natalie totally uses you! So cute. I still haven't read anything by Holly Black, but I've heard great things too. I also picked up White Cat at Smart Chicks, but haven't gotten around to reading it yet. I'm glad the story got better for you. I'll have to move it up on my reading list. @Missie It's a really great relationship! I like to think of Kelli as my filter and I am her compass :) I really need to have a shirt made that says "Book Snob"
Wasn't Holly Black just awesome! I just loved this book, and I am ready for RED GLOVE.